If you’re staring longingly at your half-grown peas, wishing you could be enjoying that fresh spring taste right now, then I’ve got a great recipe for you! Turn the grill on high. Peel and clean your shrimp, then sprinkle with salt, lemon, and any other seasonings you might have (I didn’t use dill, but it would probably be fantastic). Remove the seeds from a sweet pepper and chop it into skewerable squares. Head over to your pea plants and pick a leaf or two off each plant. The bigger and older, the better. 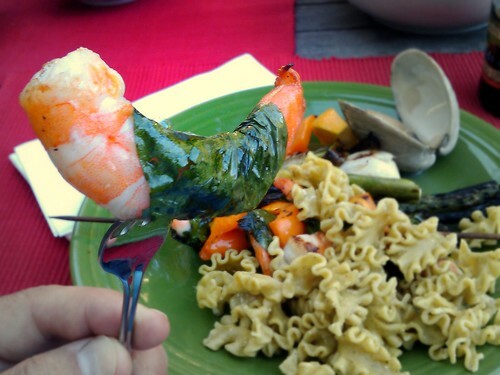 You’ll need one leaf for each shrimp. 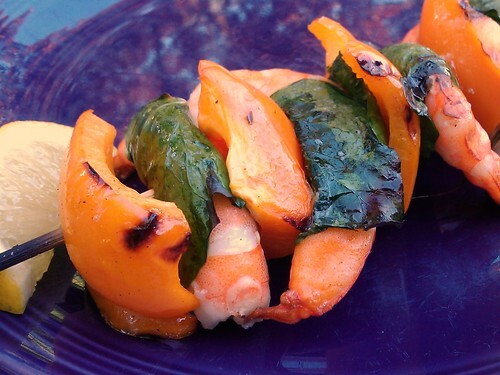 Grab one shrimp, wrap it in a leaf, skewer it, then stick on a piece of sweet pepper. Repeat until done. Add a bit of oil to protect while cooking. I gave the skewers a quick spritz of cooking spray; alternately you could toss or brush with oil. Throw ’em on the grill! With high heat, they need just a few minutes on each side. The pea leaves help to protect the shrimp from drying out in the high heat of the grill, and they provide a nice, subtle hint of pea flavor that goes well with the light sweetness of the shrimp. We enjoyed ours with some other springtime favorites: grilled asparagus and sweet Walla Walla onions. Add some simply dressed lemon-parsley noodles and a glass of wine and you’ve got a great spring meal! You are currently browsing the Steve's Big Adventures blog archives for May, 2009.